Hey guys, this foundation for some reason just never pulled me in to trying it before. Maybe it's the $55 price tag or thinking the undertone was off or being scared off by the extreme coverage level. Nonetheless, it's a bit of a classic for very fair skin. I thought I'd finally try it out with the last Sephora sale and it's been a little bit of a struggle. Details on how it works on my face are in the video! First swatch is wet, second swatch is after drying for 30-40 minutes. I bought NC5 the moment it was released without doing too much investigation. I heard a lighter shade than NC10, YES! Well, it turns out, it's not actually lighter. It's a different undertone. It basically just looks darker and more golden. So, I got myself together and recorded a lot of swatches, demos and review / wear test so you can see how these shades stack up against each other as well as compared to a ton of other things in my collection. For reference, my closest shade match is Colourpop No Filter Foundation in Fair 05. Hey guys, I was excited to try out this new foundation launch so I picked up two shades when it was available early for Platinum members at Ulta. I did a bunch of comparison swatches as well as used in a GRWM. 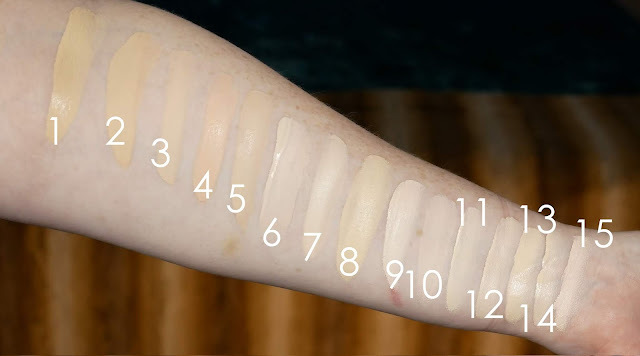 Hey guys, I love foundation (obviously) but when I saw that Double Wear released a new lightest shade that was *actually* very fair I jumped on it right away. So excited to use the cult classic in a shade that might actually work for me! I recorded a review / demo / swatch / wear test video for you guys and here are the swatches up close and personal.